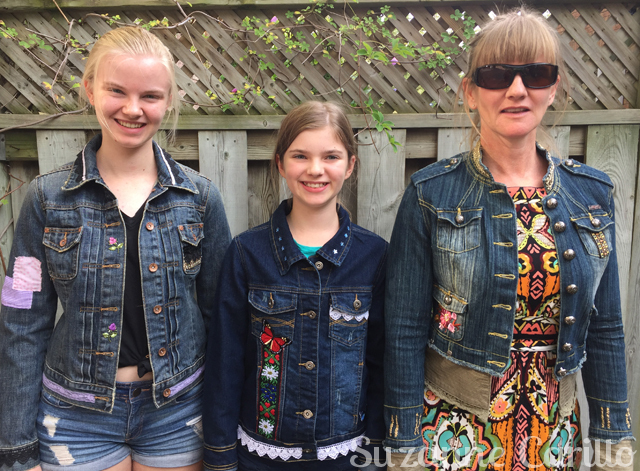 I’ve had a DIY project on my mind for a while now and when my sister and nieces came to visit last week I was able to finally able to turn a jean jacket into wearable art. I’ve painted on jeans for years. I once had a fantastic jean jacket I handed painted inside with the image of Jim Morrison. I really wish I hadn’t given that jacket away. I have kept t-shirts I’ve painted along with jeans and shorts from years past. It was in the late 80’s and early 90’s that I did the most painting on fabric so returning to this medium wasn’t a huge leap for me. For my two nieces that have always painted on canvases or paper though it proved to be a bit more challenging. 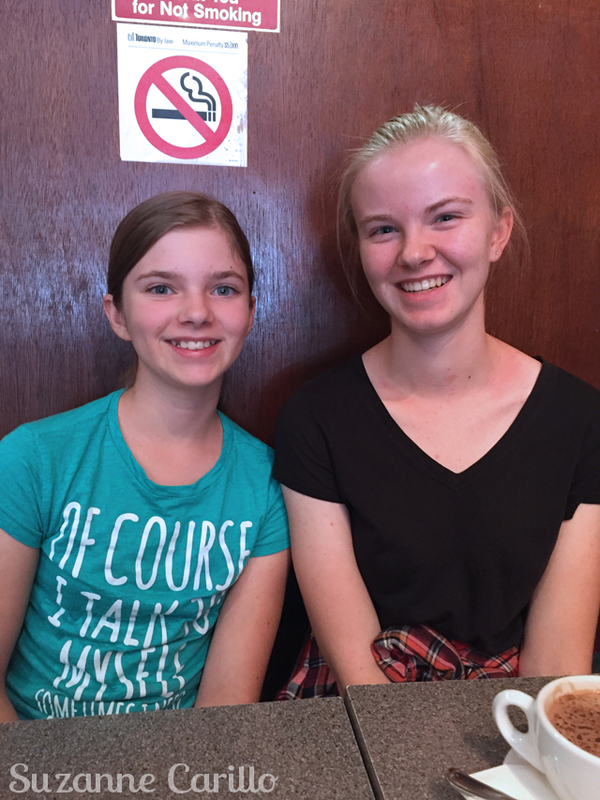 Reese is 11 and Rylee just turned 15 and yes, she is taller than me. 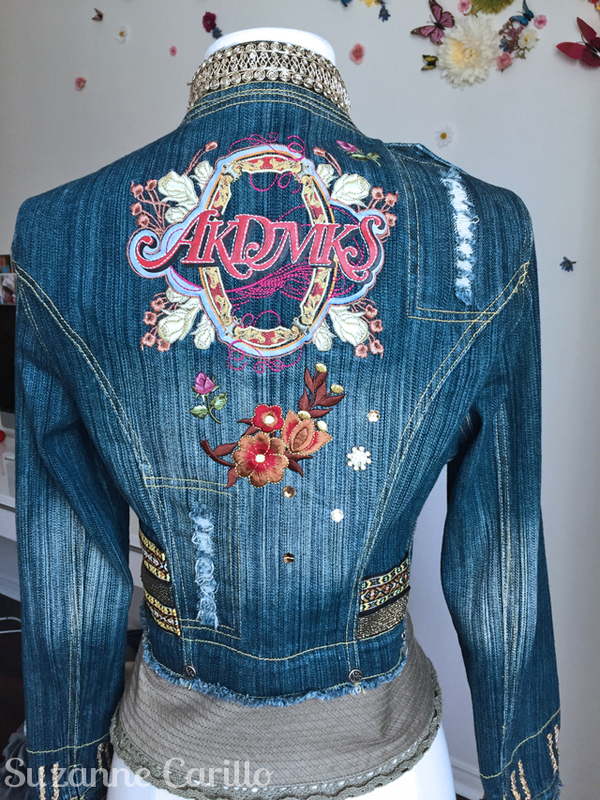 In the end though they pushed through their initial difficulties and I think you will all agree that these one-of-a-kind wearable art jean jackets all turned out incredible. We thrifted all of the jean jackets and picked up the sewing trims at Fabricland and iron on letters at Michaels. 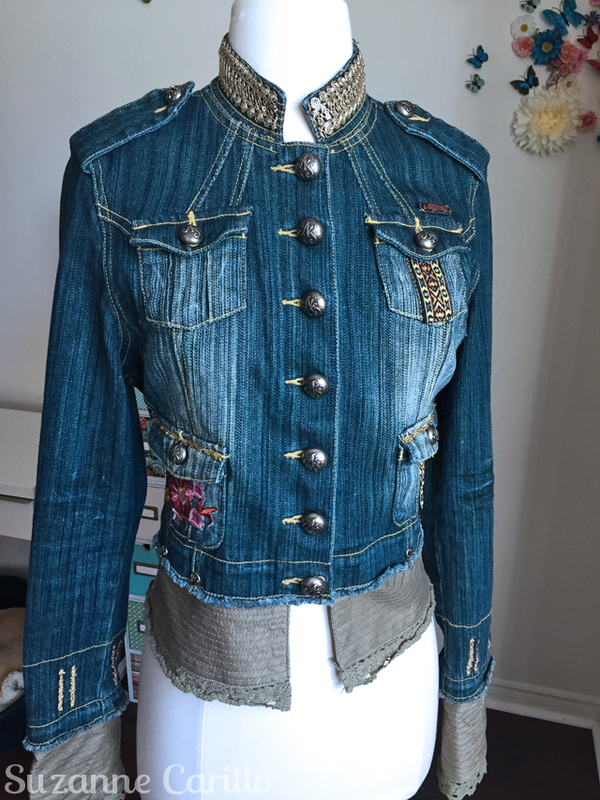 My sister bought a jacket that was already quite embellished however that didn’t stop her adding more and really making it her own. You can’t see it well but she hand stitched on crystal beads on the pockets. 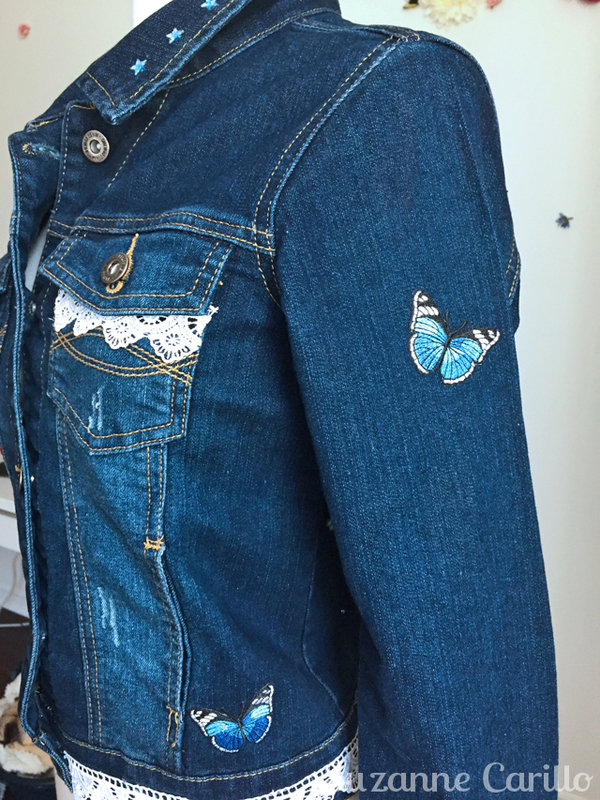 Reese decided to paint a girl and an owl on the back of her jacket along with handmade fabric leaves, flowers and iron on butterflies. 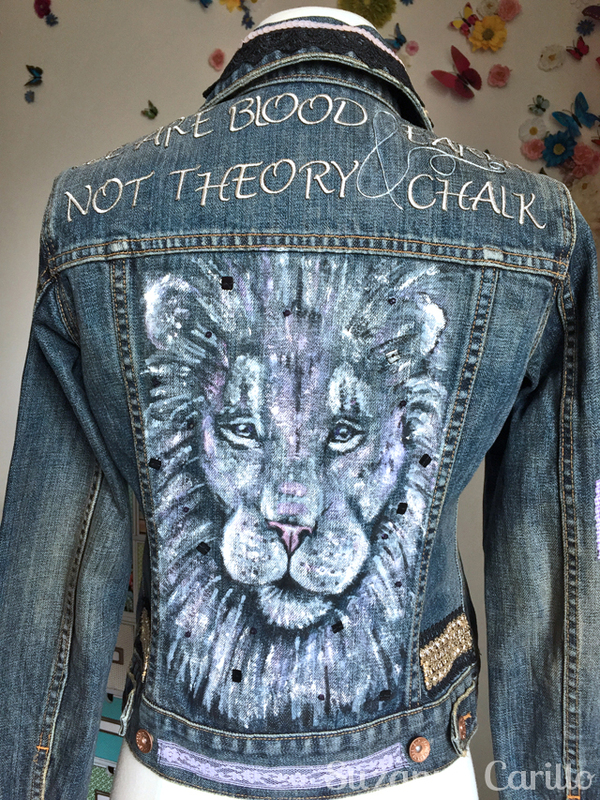 Rylee painted a lion on the back of her jean jacket. Sadly the camera didn’t pick up all the sequin and crystal beads she sewed on by hand in his mane. You really need to see these pieces in real life to appreciate all of the details and hard work that went into them. I wasn’t able to create my own as I was too busy helping everyone else however after doing this little “workshop” I’m geared up to try something soon. I’ve started painting on a blazer that I can’t wait to get back to. I did a couple other DIYs previously on jeans you may want to check out too… embroidered jeans, patchwork jeans, and paint splatter jeans. 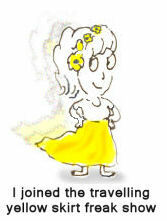 Do you ever alter your clothing? 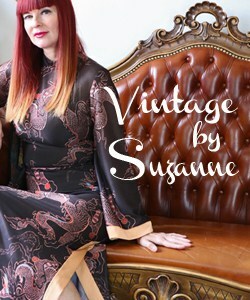 Do you like the idea of creating wearable art? This Park and Cube shows a DIY how to paint leaves on white shorts here which is really quite cute. I don’t agree that fabric paints are necessary. I’ve always used acrylic paints on my jeans and it works just fine, just thin them with a bit of water. It may be a bit stiff at first, but that stiffness goes away after a few washings. 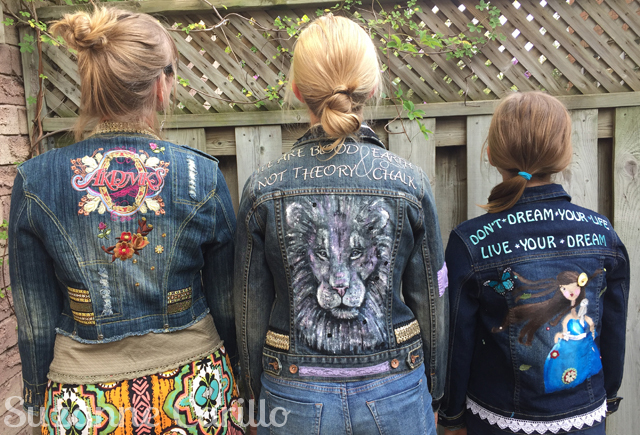 These jackets are amazing works of art. Thanks for inspiring us! They all look so cool! 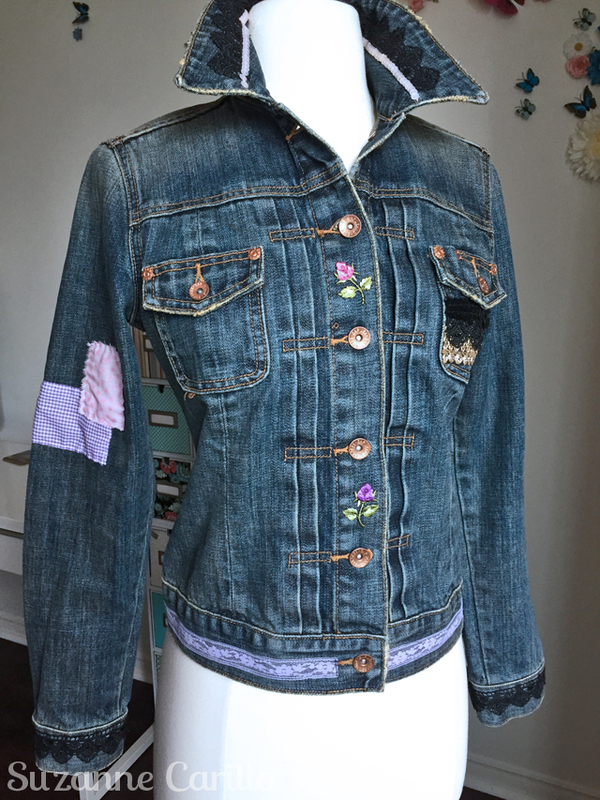 I have things sewn on my denim jacket but am afraid to paint something and screw it up. Now that’s what I will be thinking about all day. this is fantastic! I love these jackets – all of them. Your sister and nieces are so talented!! 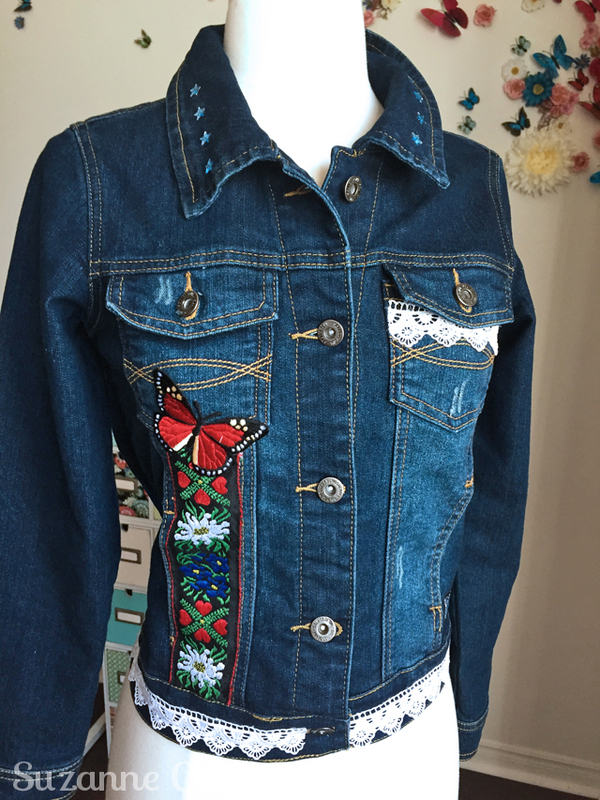 They’ve done such an amazing job upcycling their denim into custom, wearable pieces of art. You must be the favourite aunt treating them to this kind of project when they come. How lucky that you can spend time together this way. Wow! I not only love this idea but am hugely impressed at the execution. Beautiful work. The thing that appeals to me most of all about this idea is how one can create something individual and reflective of one’s own personality. Too much fashion is purchased generically. Thank you for the ideas and tips for painting onto fabric! I may have to invest in some acrylic paint…. What a great idea for spending quality and creative time with your sister and nieces. The results are unique and beautifully executed. I’m starting to experiment with paint on clothes, and on leather, as you saw with my Docs on Instagram. It’s time consuming, and so far, I don’t feel like I know what I’m doing, but I’m sure I will get more confident with more practice. One day I really must attend Suzanne Carillo Summer Camp. 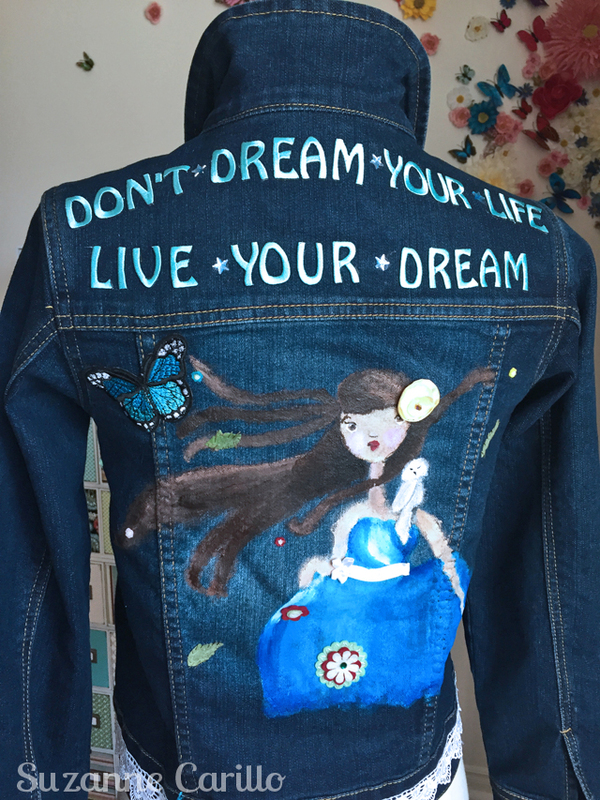 I used to paint denim with my nieces many years ago!! They have older children of their own now so it may be time to do a replay. I picked up some supplies at Michael’s just today for a stenciling project I’m planning on a denim bomber jacket. You ladies clearly had a wonderful time together and the jackets are so fun. The lion painting is amazing!!! PS. I think it’s very cool that Robert puts peanut butter cups in the gum ball machine. Wow! These really are incredible. You could make a fortune selling customised denim jackets – a friend of mine sews cushion covers he picks up from markets in Thailand on his and knocks them out for £50 a pop. really fabulous Works of Art! 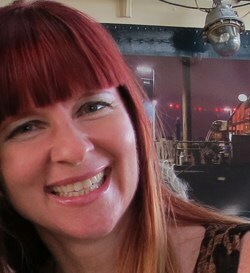 !, I love how every jacket shows its owner’s personality, and love all those details which make every jacket different!